How do perfumers actually make their fragrances? How did they learn the methodology, process, and chemistry-related aspects of perfume creation, particularly if they are self-taught? How do they feel about various materials? Are some trickier to use than others, and is there a difference in the process of handling naturals versus aromachemicals? What are some of the logistics involved in wide-scale production and starting a perfume house, as well as taking a finalised product and releasing it? Liz Moores of Papillon Perfumery. Source: Liz Moores. Those are some of the questions that I asked Liz Moores of Papillon Perfumery. It is in the first in a series of interviews that I hope to post over the next few weeks, as the various perfumers’ schedules permit. Several of the interviews have sections that intentionally cover the same subject-matter, focusing on the process of learning notes and creating fragrances, as well as each perfumer’s methodology. Many of the perfumers are self-taught, so I think seeing differences in how they answer the same or similar questions will be revealing. We all start some place, even perfumers who have received acclaim for their creations or who are the best in their particular field. So, I’m interested in their educational journey, but I’m also curious about other things, like the precise logistics that are entailed in launching a fragrance, particularly for those perfumers who are subject to the rather exhausting list of EU regulations. We all know about the oakmoss issue, but what are some of the more unexpected side-effects or obstacles that a perfumer may have encountered? 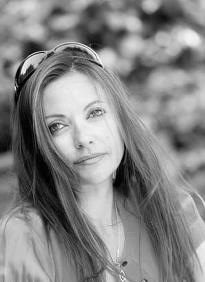 Liz Moores answers all those questions and more. 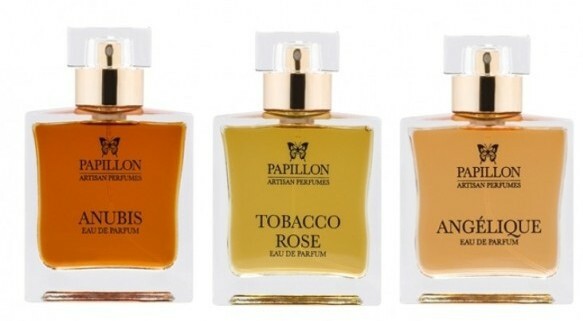 If you’re unfamiliar with the name, she is the founder and nose of Papillon, a British artisanal brand that launched last year to great acclaim with three debut fragrances. I fell hard for Anubis, an incredibly complex fragrance with so many facets that summarizing it as a “smoky, leathered, ambered oriental” simply doesn’t do it full justice. I thought Anubis was the second best new release of 2014, but its siblings, Angélique and Tobacco Rose, were very well done as well. Her answers to my interview questions are truly revelatory, in my opinion. I mean it quite sincerely and honestly when I say that my jaw was almost on the ground as I read her wonderfully detailed, thorough, straight-forward but incredibly informative explanations that are unlike anything I’ve encountered thus far in showing not only how someone learns about perfume creation, but how the process works. She also, and very generously, shares an astonishing amount of information on such rarely discussed technical matters as: “Mods” (basically, the industry term for the modification stages a perfume undergoes in the development process); the impact of aromachemicals in the balance of notes; EU compliance procedures, MSDS sheets, and the unexpected obstacles that EU regulations sometimes create; how a perfumer who is just starting out obtains supplies for large-scale production; and the logistics of how a small perfume house functions. I was utterly riveted, and I think you will be, too. So here is Part I of what will be a two-part interview. Part II will focus on the more logistical side of producing and releasing a new fragrance, as well as further discussing the impact of EU regulations. I’ll update this post with the relevant link at that time. Photo: Liz Moores & Papillon Perfumery.